Every time we move from one season to the next, I get very excited. Each season brings its bounty, and fall is no exception. 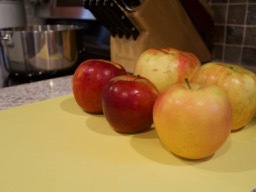 Apples are abundant at this time of year and one of my favorite fruits to bake with. I bought all of the apples used in these recipes at our local farm store, which I swear makes them extra delicious. First up…. Applesauce! 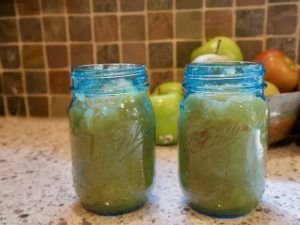 Homemade applesauce is delicious, but you have to use a lot of apples to get a little applesauce. I didn’t measure the amount of pounds or cups of apples. I just pulled out a steel-clad pot and filled it close to the top with peeled, cored, and cut up apples. I used a mix of Honeycrisp and Jonathan apples. Once they are ready to go, I put about a half-inch of apple cider in the pot to help get it going and mixed in some cinnamon for flavor. After that, I turned on the stove top to about medium/medium-low and let it all cook together. It took about 30 minutes, stirring occasionally. 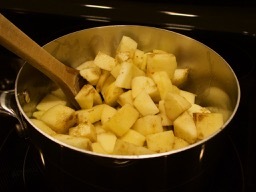 Once the applesauce was cooked, I used a potato masher to get rid of large chunks. I prefer a more chunky applesauce, but if your preference is smooth applesauce, use a blender or food processor. I then let the sauce cool and I spooned it into some mason jars for storage. Enjoy! Next Post Ooey, gooey, delicious Blondies!